In the last post in this Job series, I wrote about the Bad Theology of a Few Good Friends. Job’s three friends Eliphaz, Bildad, and Zophar were well-meaning, but had some basic theology quite wrong. It’s almost enough to make one wonder, is it so easy to get it wrong? Can we get it right? How? Can God really be known? Job’s three friends speak their minds, Job replies, and then the scene changes. Enter: the quiet friend. …The young one who has sat in reticence this entire time, listening and observing his elders in respect. But when he can’t be silent any longer, because he knows Job’s older three friends have given no real answer, he opens his mouth. Words of wisdom burst forth like springs of water. Elihu shows that he knows God. Elihu – the one whose very name means “he is my God” or “Jehovah is God” and indicates a separation from idolatry and a belief in the only true Lord. Although much younger, Elihu was the most godly friend present. He agreed with Job’s assertion of righteousness, but was also angered by Job’s attempts at vindicating himself. Job seemed more eager to prove that he was innocent than that God, in His authority and goodness, was justified in allowing what He chose to allow. Elihu was relying on sound knowledge of God’s character for his guide. So, Elihu rebuked Job for charging God with hostility toward him. In Job 37:23, 24 Elihu reminds Job of God’s goodness, authority, and justice. God wasn’t out to hurt Job! And back in Job 33, Elihu states various ways that God speaks to mankind. He explains that God can use dreams, pain, and angels to communicate with His children. He reminds Job that submission to God brings restoration. Restoration? Doesn’t that sound like what Job’s other three friends were telling Job? That submission equals restoration? On the surface, the argument looks similar. The difference is all in perspective. Job’s three friends assumed Job had hidden sin that he should repent of to gain back the external appearance of prosperity. Elihu, however, suggested Job repent of the “why me” attitude and submit to what God had allowed in his life, thereby submitting more fully to God. The submission, in turn, would restore Job’s relationship with God. I’ve learned many lessons from Elihu. One is that insubmission to God is rebellion. Ouch! You see, if I’m not submitting, I’m going against. I may not be kicking or screaming or outwardly fighting… I may just be quietly ignoring that still small voice. I may have even said, “Yes… I’ll submit to you there… but not now…. later.” Rebellion isn’t pretty and it has consequences. Elihu is also a good reminder that we can truly know God and have a close relationship with our loving Redeemer, who only wants our best. His assertion that God can do no wrong is accurate and while most of us know that intellectually, it can be forgotten in the heat of battle or in the depths of despair. Like Job, at times I’ve had a “why me” attitude rather than using my afflictions or trials as an opportunity to burrow deep beneath the wing of my Father. I pray to become more like Elihu, who (when confronted with grief and pain) boldly and immediately turned to the truths of God rather than personal viewpoints and opinions. At the beginning of this post I posed a few questions… Is it so easy to get our theology wrong? Can we get it right? How? And, can God be known? (Keeping in mind John 14:6, and Acts 17:26-28)As Elihu shows us, we don’t have to get it wrong. Spending time in God’s Word and with Him in prayer, then living what He’s shown you is the way to build an accurate, strong faith. What lessons do you see in the faith of Elihu? How does God remind you that He can be known? Do you fully grasp that suffering and trials can be used by your loving Father for your refinement and eternal good? **If you would like to use this series as a Bible study, here are daily assignments until next week. Read Elihu’s first speech in Job 32 and 33. Why do verses 8-9 in Ch. 32 demonstrate that Job’s three older friends did not have understanding? What stands out to you in Ch 33? Read Elihu’s second speech in Job 34. What do verses 10-12 and 21-23 specifically tell us about God’s character? Read Elihu’s third speech in Job 35, and the first half of his fourth speech in Job 36. What does Elihu tell Job about vain prayers in Job 35:12 and 13? What do verses 7-12 teach us about suffering and refinement? What things have/are you suffering and how has that refined you? Read the remaining half of Elihu’s fourth speech Job 37. How does knowing of God’s awesome power and authority comfort you? Read 1 Pet 5:10. (Note: 1 Pet Chapters 3 and 4 also discuss Christian suffering.) Now, look up several translations of verse Job 37:23 and meditate on this today. Read Commentaries on Elihu. 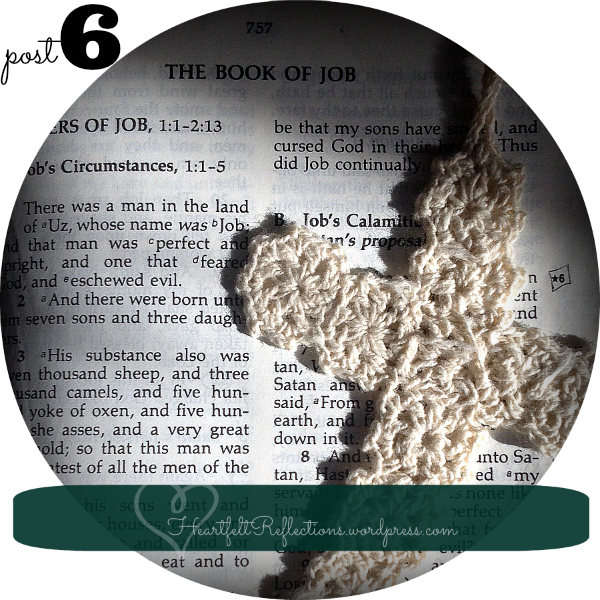 I found these especially helpful on Job 33 http://www.christnotes.org/commentary.php?com=mhc&b=18&c=33 and Job 34 http://www.christnotes.org/commentary.php?com=mhc&b=18&c=34 What other lessons is God showing you? Would it be ok, if I printed this out for my personal Bible study and quiet time… LOVE how you make me dig in!!! Absolutely, Heidi!! My goal is to get this polished, put together into an e-format, and flesh the homework out a bit. Then I’ll considering whether or not to charge a small fee for it. But right now, enjoy it as a gift!! And I’m so glad you’re enjoying digging into Job with me! God bless! !